Enter National Geographic reporter Rick (Driver) who sets up an agreement between Robyn and the magazine. Part of this agreement is he will meet up with her at various points along the trek to take photos. This initially bothers Robyn a great deal but as the journey continues, the two become friends. This movie could so easily have gone so very wrong and been so very boring. But it is the polar opposite. It was warm and alive and sumptuous and gorgeous and mesmerising and completely engaging. I loved each and every second of this movie. As an Aussie, I find our outback breathtakingly beautiful. The vast emptiness is enticing and soothing for me. The colours and contrasts….or lack of contrasts as the case so often is ….. are simply gorgeous. Wow! I think I have literally run out of superlatives …..
Robyn’s journey is filled with a quiet drama that is sometimes felt rather than played out. Her self doubts about a month in when she wonders why she is even doing this. Her desperate panic when she wakes one morning and the camels are gone. To this end, we never really discover what her motivation for this trek was. I think she is simply a wanderer….. a soul whose connection to our planet is so powerful that she cannot help but move as she does. 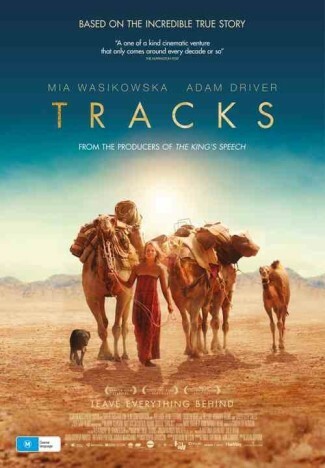 She encounters some wonderful characters along the way, most notably the chatty Aboriginal Elder Eddie (Mintuma) who must accompany her through sacred Aboriginal lands that forbids women travelling alone. He teaches her much about the land through stories. He talks in his native language but is easily understood as with many indigenous tales, there is lots of movement and gesturing. An amazing part of the movie, the scenes Robyn and Eddie share. If you want your action and drama in your face, Tracks is not for you. If you love a great story with the drama a little more subtle and subdued, then you will love it. It is a feast for the eyes, the heart and the soul. You can feel the ancestors and spirits of our country alive throughout the entire movie. if you have visited or lived in the outback as I have, you understand how you can feel a land. This movie is the closest you will ever get to that feeling without actually being there. I love my Aussie movies and I adore this one. Please….. dont miss this movie and support our local industry.